Interestingly of course, the federal government does not in general build bridges and roads. It redistributes (that word again) money collected in the states (particularly the federal gas tax) back to the states that, along with locally collected funds, enables states to build (or more precisely hire contractors to build (or even more precisely, hire contractors to hire subcontractors and laborers to build)) bridges and roads. We built bridges and roads before the federal government got involved. We probably would benefit from a debate as to what the federal value added in the redistribution of funds is. It is also interesting that building bridges and roads is something a Republican actually feels comfortable in assuming as a shared responsibility, clearly they have never heard of road privatization. One might call them “socialists”, if one called people names or labeled people. “Watch the entire process of moving the 6.5 million pound bridge down the river and being lifted into place, which took about 60 hours from start to finish, according to the Minnesota Department of Transportation. In my pedestrian-centric view, The most important one is on the right: “Hey Drivers … EVERY CORNER IS A CROSSWALK. Yep … every single one”. This is especially needed at T-intersections of minors meeting majors. 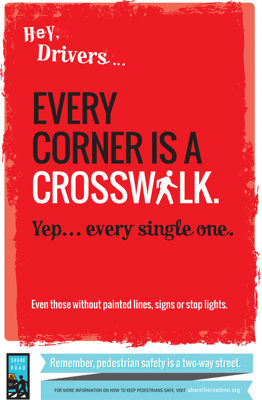 Especially unmarked crosswalks. Now if there could only be consistency about crosswalk markings (i.e. 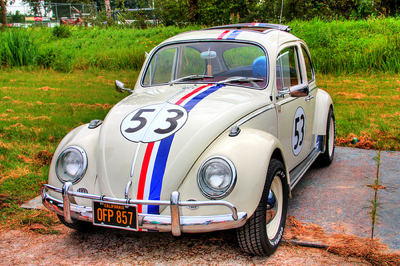 no markings) to help remind drivers of this. We see gobs of money spent on new “affordable housing”. Ok, “gobs” is not a very precise term. Marlys Harris reports in streets.mn affiliate MinnPostthat nonprofits are pushing for 4500 units of affordable housing on the Central Corridor. You can do the math on how much that would cost. This of course is arbitrary. Clearly it is more difficult to spend 35% of gross income than 30%, or 30% than 25%. Canada once had a 20% rule, India has a 40% rule. Incomes vary, so typically affordable housing programs are concerned with affordability relative to median household income. So why is it government’s business to build, or encourage to be built, new, affordable housing? Public housing, the “projects,” were often built in the US from the New Deal through the Great Society eras, and were one set of attempts in the US to address the problem by building new houses to replace inadequate old houses. (Public Housing has an earlier history in Europe, e.g.). But soon these projects came to be seen as the problem not the solution. Newer housing programs diffuse these housing projects a bit more (I suppose they could not have been diffused less) throughout metropolitan areas (scattered-site housing), though there is a focus on affordable housing around transit stations, limiting the diffusion. Marlys Harris reports Myron Orfield research “since 1986, 83 percent of affordable housing units in the metro have been located in a way that contributes to segregation.” The HUD program HOPE VI aims to fix existing housing projects, though it may replace 2 units with 1, thereby reducing the supply of housing. There are also housing voucher programs. In the US, “Section 8” (or Housing Choice Voucher Program) is a major version of this. It currently subsidizes the rents of 1.5 million households. (The program also has a supply-side component, which subsidizes the production of housing). In a Transit Improvement Area (TIA) designated by the Minnesota Department of Employment and Economic Development (DEED) or TIA-eligible station areas located along light rail, commuter rail or bus rapid transitways operational by 2020. Within one-quarter mile of any spot along high frequency local bus lines. Within a one-half mile radius of bus stops or station on high-frequency express routes where significant passenger infrastructure is in place. Tax Base Revitalization Account (TBRA) Contamination Cleanup Site Investigation TOD grants – these grants are intended for applicants that have or will purchase a redevelopment site with suspected or perceived contamination and are seeking public funding to assist with the cost of determine the scope and severity of the contamination and to develop a cleanup plan. The investigation grants are intended to encourage an early start to the environmental remediation process. TBRA Contamination Cleanup TOD grants – these grants are intended for applicants that have recently completed their cleanup site investigation and are seeking public funding to assist with the cost of implementing a cleanup plan and beginning redevelopment. Livable Communities Demonstration Account (LCDA) Pre-Development TOD grants – these grants are intended for applicants who are defining their project through such activities as design workshops, preparing redevelopment, corridor or station area plans, developing zoning and land use implementation tools such as overlay zones or zoning districts, or determining strategies for land banking and land acquisition. begin development or redevelopment and are ready to build the infrastructure necessary to support it. I am okay with contamination cleanup site grants. Someone has to clean them up, and clearly we have failed previously in making the polluters accountable. It is the Livable Communities grants that puzzle me. The transit system was supposed to create value, the developers should be paying a premium to be near it (a premium which we can capture to help pay for the infrastructure), we shouldn’t be paying them. We have lots of existing housing that is slowly deteriorating due to lack of capital infusion. Yet we spend money to create new developments. Wouldn’t it be better to give money or vouchers (if you don’t trust them with cash) to the people you want to help (low or low-middle income people), and let them purchase (and repair) housing on the open market? Or give money to people salvaging existing structures that would otherwise go unused, if salvage costs are less than new construction. There are at least 700 vacant and condemned properties in the City of Minneapolis alone (2011 data). This does not include vacant rental properties. The Census found 15,000 vacant units in the City of Minneapolis. Making housing “affordable” should start there. If there were a demand for housing near transit, which there should be if it is in fact as useful as the planner claim, it will be quickly met if local jurisdictions don’t create too many needless regulations. That demand should be fulfilled by serving the best and highest use, to maximize the value captured by the community from its infrastructure. New affordable housing is the same model we have with public infrastructure, it is much sexier to build a new road or rail line than maintain or rehabilitate an old one. Clearly it is sad when someone cannot afford to live in adequate housing. But there is lots of housing around which is vacant or not fully occupied, and there are lots of people with inadequate housing. Unemployment in the residential construction trades is still relatively high. Neighborhood groups are trying to save some of these vacant and condemned houses. This seems like a market clearing problem, not one requiring new supply. More people are driving alone, carpooling, biking, walking, and taking transit to work. There are more people working. “As estimated employment improved from 137.9 million in 2010 to 138.3 from 2010 to 2011, there was an increase of 800,000 in the number of commuters driving alone, which, as usual, represented the vast majority of commuting (105.6 million daily one way trips), at 76.40 percent. This was not enough, however, to avoid a small (0.17 percentage point) decline in market share. Car pooling experienced a rare increase of 120,000 commuters, which translated into a 0.1 percentage point loss in market share, to 9.68 percent. Transit increased 190,000 commuters, and had a 0.09 percentage point increase in market share, to 5.03 percent. This brought transit’s market share to above its 2008 share of 5.01 percent and near its 1990 market share of 5.11 percent. The Transportationist just loves him some S-curves. 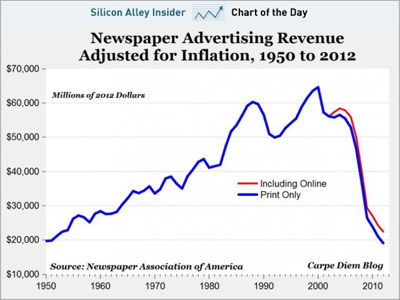 This via Business Insider: CHART OF THE DAY: Newspaper Advertising It is self-explanatory (and speaks to dematerialization and substitution of the electronic for the physical).